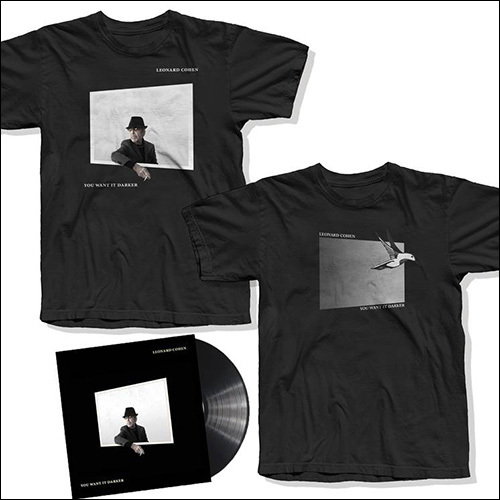 To mark the release of Leonard’s forthcoming album You Want It Darker a selection of album bundles are now available at The Leonard Cohen Shop. (September 21, 2016) Sony Music Entertainment Canada and Columbia Records celebrate Leonard Cohen’s 82nd birthday with the announcement that his 14th studio album, YOU WANT IT DARKER, arrives in stores on October 21st, 2016. The new collection of startling songs was produced by his son Adam Cohen, and is available for pre-order now. The first single and title track, which delves into an unflinching exploration of the religious mind, arrives at radio today. Cohen created this hypnotic groove with the addition of Montreal’s Cantor Gideon Zelermyer and the Shaar Hashomayim Synagogue Choir, whose voices invoke a sound from Cohen’s youth. Hypnotic groove. The surprise of a great synagogue choir. An unflinching exploration of the religious mind. One of Cohen’s signature melodies. A confession of the selfishness of love and the hope of a correction. An old man’s take on desire. A slow, relentless, and somehow joyous ballad of letting it all go by. A guitar solo you will remember. A classic Cohen love song: the deep gratitude felt by one heart opening to another. A seeker hits the road and finds the joys of solitude. The feeling of a prayer that’s been there forever, but the spiritual comforts of the past no longer available. A song of courage as the heart moves into the darkness. A brilliant reimagining of “Treaty” as a string quartet; a truly glorious moment ending with a few words from Leonard himself. This great artist continues to astonish us. Uncompromising and urgent, YOU WANT IT DARKER is the latest chapter in Leonard’s significant contribution to contemporary music and thought.